There have been several days when the temperature has broken 100 degrees. My hope was that the AP system would keep the plants cool and avoid damage. No such luck. This is known as “blossom drop” and it happens when the plant is stressed. I see it happen when the weather brings 90 degree or higher temps. I think I’ve been fortunate that it hasn’t happened more. I’m not sure what I can to to avoid blossom drop. I may build a cold frame or greenhouse around the beds and pull a shade over them when it gets hot. Misters (spraying a fine mist) might also help. The good news is that some blossoms survived and I see more tomatoes coming on. I think it’s amazing considering how new the AP setup is. 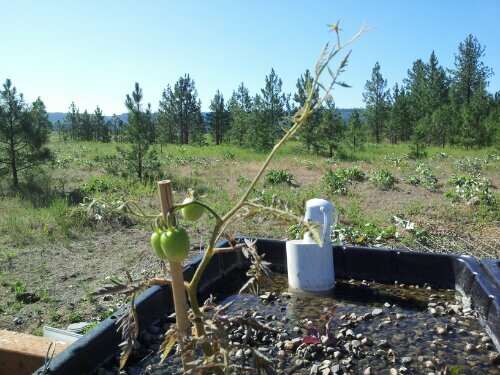 This entry was posted in Aquaponics and tagged blossom drop, heat, tomato, tomatoes by admin. Bookmark the permalink.